Celebrate your faith and your sport! Sterling Silver jewelry brings the beauty of silver together with durability, for a long-lasting, heirloom piece of jewelry that can be worn with confidence daily. Stainless steel plated chains are chemically engineered to resist corrosion due to body oils and sweat, and to provide endurance and strength for constant usage. 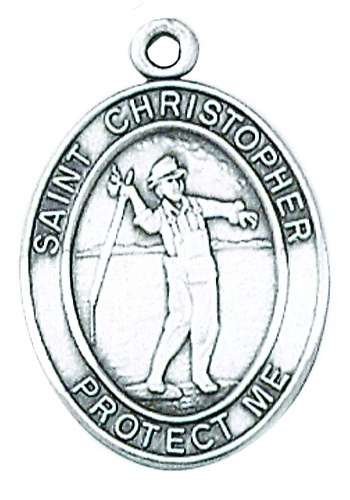 Each St. Christopher sports medal features an image of the sport on the front of the medal, with a prayerful invocation to St. Christopher, and an image of St. Christopher on the reverse. Guaranteed to last a lifetime, this wonderful pendant is the absolute highest quality, and 100% Made in the USA! We are proud to sell Jeweled Cross Medals & Religious Jewelry, some of the highest quality Catholic medals & jewelry available. Proudly manufactured in America, each Jeweled Cross piece comes with a Lifetime Warranty. Jeweled Cross stands behind their products, and so do we!